A decorative flower and leaf design with a baroque flair and reminiscent of the woven fabrics of the early Renaissance period in Northern Europe. With the feel of a rich tapestry, the colors are warm and a bit spicy. You’ll love it so much that you’ll want to display this design year-round. 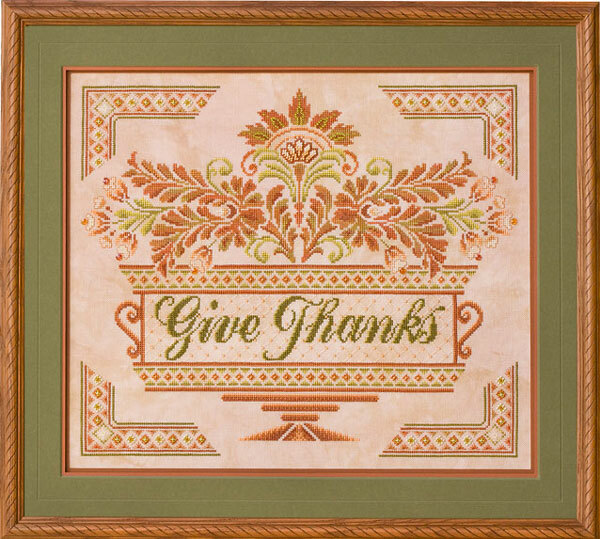 Stitched entirely in full stitches and accented with a large Diamond Eyelet in each corner, a generous amount of Half Diamond Eyelets in the border, and four colors of Mill Hill Beads throughout the design. Graced with Mill Hill Crystal Treasures applied at the ends of the flower buds. Completed on “Earthen” 28ct Cashel Linen by Picture This Plus. Fabric: Stitched on 28 count “Earthen” Cashel Linen hand-dyed by Picture This Plus. Materials Summary: Uses a total of 8 Anchor/DMC colors, 3 colors of Caron Wildflowers, 4 colors of Mill Hill Beads and 2 colors of Mill Hill Crystal Treasures. *One skein/spool unless otherwise noted.